Celebrate The Steak Maestro’s 70th Birthday And Help Make A Huge Impact On The Lives Of Local Kids. Jeff Ruby Culinary Entertainment always goes big when it comes to celebrations and the 70th Birthday of its founder will be no exception. On April 29th at Jack Casino Cincinnati, guests will experience a glittering night of absolute over-the-top excitement featuring live entertainment from multi-platinum supergroup Kool and the Gang. You’ll also be able to rub elbows with Ruby’s celebrity friends, including John Calipari, Kix Brooks, Lee Greenwood, Anthony Muñoz, Cris Collinsworth, Bootsy Collins, Chris Mack, Mick Cronin and others all while enjoying heavy hors d’oeuvres, sushi, a full premium open bar, and more exciting surprises. But this is a party that’s more than just a good time—it’s a chance to give back, in a very Jeff Ruby way. 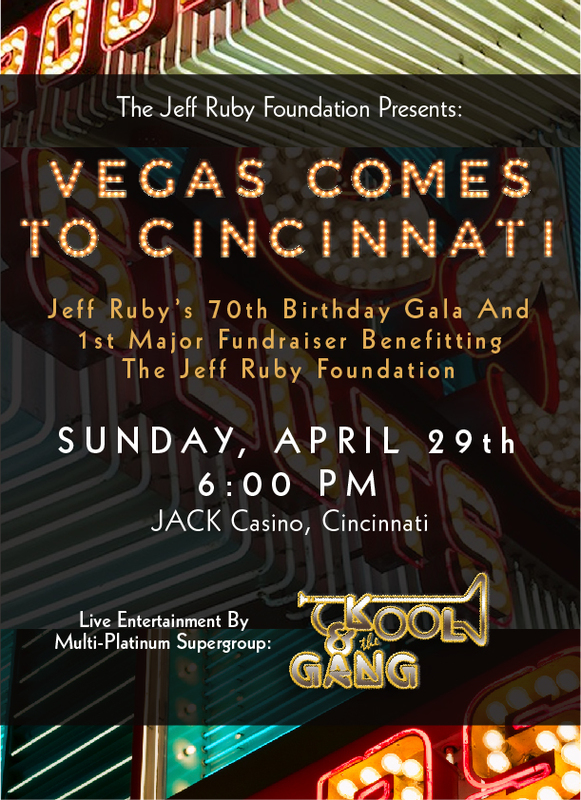 Vegas Comes to Cincinnati is the 1st major fund-raising initiative for the Jeff Ruby Foundation. And in the same way he throws big celebrations, Ruby has lofty goals for his good works, too. Recognizing that Cincinnati ranks in the top 5 in childhood poverty in the nation, Ruby has purposed his foundation with “getting us off this list, quickly.” He plans to positively alter the destinies of children and vulnerable people for generations to come through his efforts and marks 2018 as the year it starts getting accomplished. With childhood hunger, poverty, and the foster and adoptive care systems identified as root causes of greater systemic problems in our culture, the foundation is out to remedy these issues—and by joining the party, you can help. Proceeds from ticket sales will benefit the Foundation directly. For more information on this amazing event and to purchase tickets, please click here. Join us there and turn this birthday party into an event that helps change the future of Cincinnati for generations.